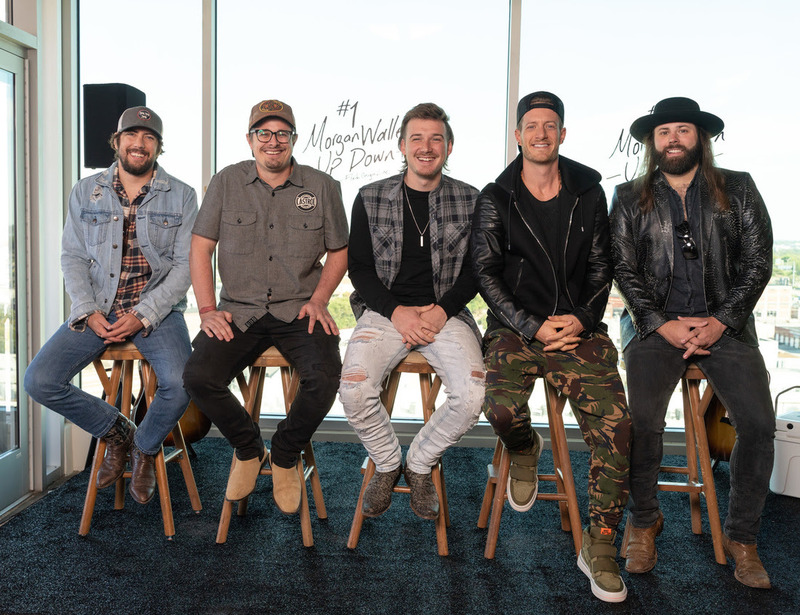 NASHVILLE, TENN. (October 18, 2018) — Big Loud Records’ rising star MORGAN WALLEN toasted his first #1 hit yesterday (10/17), partying in rooftop-style for his PLATINUM-certified chart-topper, “Up Down” (featuring Florida Georgia Line). Taking over the Thompson Hotel’s vibey L.A. Jackson rooftop bar in Nashville, BIG LOUD, BMI, ASCAP, Wallen and the backwoods anthem’s talented writers – BRAD CLAWSON, HARDY and CJ SOLAR – were on top of the world as they turned their Shiners “Up Down” in celebration, along with many of the industry pros who made the smash possible, including FGL’s TYLER HUBBARD. Each said a few words in appreciation, and then received mementos to commemorate Wallen’s career first. “I heard FGL for the first time hanging with friends out on a boat and thought they sounded cool. I never thought I’d be here, standing next to T-Hubb – and shout-out to BK – who are now like brothers to me, and celebrating a #1 song. I still can’t believe this is real,” shared Wallen. View photos of MORGAN WALLEN’S “UP DOWN” #1 party here. A surprise announcement came later on, when Wallen revealed the details of his 2019 headlining tour. Beginning January 5 in Milwaukee, Wisconsin, the IF I KNOW ME TOUR will hit 26 cities from coast-to-coast including a hometown show in Knoxville, Tennessee, plus stops in Boston, Massachusetts; Denver, Colorado; Los Angeles, California and more before wrapping in Salt Lake City, Utah, on March 30. Presented by Shiner Light Blonde, the IF I KNOW ME TOUR follows his successful spring 2018 headlining UP DOWN TOUR and will feature emerging Big Loud Records artist (and “Up Down” co-writer) HARDY as the opening act, with presales starting October 23 on Spotify followed by Wallen’s Fan Club / VIP Nation on October 25, and becoming widely available on October 26. Meanwhile, Wallen is now featured as the latest Taste of Country RISERS, performing a stripped-down version of his buzz-inducing new single, “Whiskey Glasses,” which the Country outlet said revealed “a man who is clearly more than just party songs.” Check out Wallen’s Taste of Country RISERS feature here. The follow-up to his first #1 hit, “Whiskey Glasses” is currently making its way up the Country radio airplay charts as part of Wallen’s wave-making IF I KNOW ME album debut. Fans can catch him now on JAKE OWEN’s LIFE’S WHATCHA MAKE IT TOUR through November 3, after taking the stage in front of arena-sized crowds supporting LUKE BRYAN and FLORIDA GEORGIA LINE.